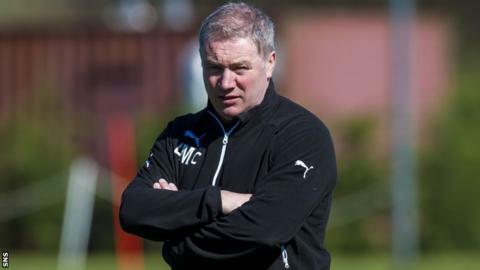 Manager Ally McCoist is "staggered" by the reported losses Rangers have sustained in the past two seasons. The club revealed the £70.7m raised though season ticket sales, commercial revenues and a 2012 share issue had been spent "relatively quickly". And Rangers say they need to raise £30m by 2017, including a new share issue, to compete in the top flight. "I'm hoping that the club moves forward but I was staggered at the losses," said McCoist. The financial details emerged following the publication of chief executive Graham Wallace's 120-day business review. The Union of Fans - a collective of Rangers supporters groups - said they were "dismayed and hugely disappointed with the content of [the] review". McCoist, who will hold talks with Wallace over his transfer budget for their Championship campaign next season, added: "And I probably should mention that I am totally against any indication that the players have the money. "One or two people have wrongly questioned players coming in and money being spent. "Just to put the record completely straight on that, we didn't spend any money at all on the players, the budget came down, the wages in relation to turnover at the club is probably the envy of any club in world football. "So although some of the money has gone on players' wages, it is a very small fraction of where the money has gone. "It (the ratio) is maybe 27/ 28%. I think the lowest in the Championship last year was 53 or 54% so that would give you the indication that the players' budget should be well within the overall turnover and is within the overall turnover. "So, I refute the players taking any stick at all on it, plus the fact that it wasn't myself who offered the players the contracts." With the Rangers board and former director Dave King locking horns over the future of the Ibrox club, McCoist insists he will not become involved in the public feuding. "I have the safety valve of Graham and the board and Dave King not wanting me to get involved," said the Gers boss. "The supporters have earned the right to make their own mind up. "They have done nothing but shown us incredible loyalty since we began but particularly since we went into administration and I think it is safe to say without them we wouldn't be here. "So I don't believe they need me to stand on a soap box - and that's not me relinquishing my duties - and tell them what they should and shouldn't be doing. "They have absolutely earned the right to make up their own minds." King has been scathing of Wallace's review, which includes the aim for Rangers to be Scottish Premiership champions by 2016/17. McCoist admits that particular goal was "very ambitious" and stressed that investment would be needed. "We have always been ambitious, always set our targets as high as possible and I understand and accept that," he said. "I wouldn't want that to change at all. And, hopefully, if we do get investment, those targets can become realistic which is where we want to be. "We need investment. I don't think it is as much rocket science as people are making out. "If you lose in the region of £35m to £45m worth of players (due to administration) and don't buy to replace them you are going to struggle to compete at the level you once were."